Spring has finally arrived, and with its arrival, I2SL continues to grow, with chapters, working groups, and plans for the 2015 I2SL Annual Conference flourishing across the country. 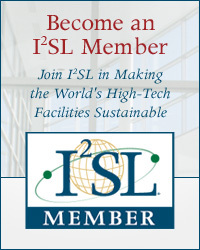 The foundation of I2SL's potential is its community of industry experts, whose insights have helped shape everything from successful working groups' tools and resources that are helping to increase sustainability within this industry to the presentations on the agenda at this year's conference. Individuals in the I2SL community make the difference, and I extend my thanks to everyone who submitted abstracts for the 2015 I2SL Annual Conference. Your submissions have contributed a dynamic conference agenda for this year's event in San Diego, California. Conference registration is now open, and I encourage you to join us at the Hyatt Regency Mission Bay Spa and Marina from September 21 through 23, 2015, to be a part of the excitement. The annual conference is a hub for exchanging ideas and is often the birthplace of new I2SL initiatives. With technical sessions, the Technology and Services Fair, discussions, working group and chapter meetings, and San Diego's beachside backdrop, you are sure to find new ways to connect, whether you're a familiar face at the event or this year will be your first I2SL Annual Conference. 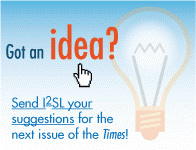 Throughout this issue of Sustainable Laboratory Times, you will find details about a variety of ways to get involved with I2SL. 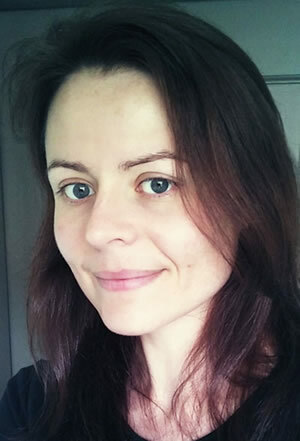 This issue also includes an interview with Alison Farmer of kW Engineering, who is leading I2SL's Laboratory Benchmarking Working Group to improve the Labs21 Benchmarking Tool. A Ph.D. astrophysicist, Alison brings enthusiasm and dedication to her efforts with the working group. If you are wondering what value there is to engaging in I2SL's working groups, chapters and conference, don't just take it from me, listen to what Alison has to say. I would also like to welcome Susan Vargas of Stanford University to the I2SL Board of Directors. With the I2SL community continuing to expand its reach, I wish you all a great summer and look forward to seeing you in San Diego. Plan to make an impact at the 2015 I2SL Annual Conference by being a part of all that the conference, Technology and Services Fair, and San Diego have to offer. Keep reading to learn more about what's in store at this year's event. 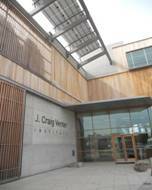 One offsite tour will be held at the J. Craig Venter Institute. Registration for the 2015 I2SL Annual Conference in San Diego, California, is now open! Conference registration gives you access to exhibits, roundtable discussions, and technical presentations featuring the latest advancements in the sustainable laboratory and high-technology facility industry. Register by Friday, July 24, 2015, to save $100 during early-bird registration. Regular registration is open from July 25 through September 11, 2015. Discounted rates are available for I2SL Members, groups of 10 or more, and U.S. Federal Government and university employees. During registration, be sure to sign up for one or both of the tours. The first tour will be of the J. Craig Venter Institute, a state-of-the-art carbon-neutral laboratory. This remarkable LEED® Platinum building features natural ventilation and passive cooling, daylighting in offices and labs, rainwater harvesting, and photovoltaic panels. The second tour will take place at the Salk Institute, an architecturally striking facility housing biological research on a range of diseases, including cancer, diabetes, and infectious diseases. Transportation and dinner are provided. The I2SL Colorado Chapter is offering two scholarships for interested persons who would like to attend the 2015 I2SL Annual Conference. Open to anyone living in the State of Colorado or Rocky Mountain region, the scholarship will cover the cost of airfare, hotel, conference registration (not including workshops or tours), and a one-year I2SL Membership. The deadline for applications is Friday, June 12, 2015. Submit an application today! Thank you to everyone who submitted abstracts during the 2015 Call for Presenters! The agenda is now available, and this year's lineup features presentations on carbon neutrality, fume hoods, benchmarking, and much, much more. 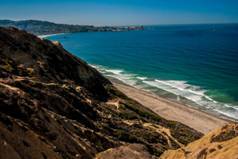 There is plenty to do and see in San Diego. I2SL's discounted room rate at the Hyatt Regency Mission Bay is available three days before and after the conference, so consider bringing your family and turning the trip into a vacation. From the beaches to the San Diego Zoo to more than 90 craft breweries, there is something for everyone! Visit the San Diego Tourism Authority's website for additional information. The 2015 Go Beyond Awards are now open for nominations. Visit I2SL's website for more information about submitting a nomination, due by Tuesday, June 30, 2015. The 2015 Technology and Services Fair floor plan is now available. As of May 20, 2015, the exhibit hall is more than 60% full, and the following organizations have registered to exhibit. Sign up today to reserve your booth while space is still available. With efforts underway to establish new chapters in Indianapolis, Philadelphia, and New York City, there is no shortage of ways to get involved with I2SL in your region. If you are interested in helping any of these chapters get started, contact I2SL. To learn more about other chapter efforts, keep reading! 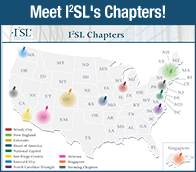 I2SL welcomes its newest chapter, the Arizona Chapter! On April 23, 2015, the chapter kicked off its tenure with a presentation, networking session, and tour of the Interdisciplinary Science and Technology Building on the Tempe Campus of Arizona State University. Attendees received a preview of what the new chapter has planned, and those who attended the tour were eligible to receive continuing education credits. Contact the Arizona Chapter if you're interested in participating in this chapter. I2SL's Colorado Chapter President Kevin Brettmann (left) and I2SL Vice President Gordon Sharp (right) present Nancy Carlisle with the Chapter Champion Award. 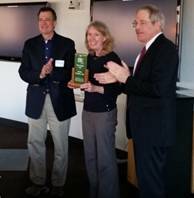 At the I2SL Colorado Chapter's quarterly meeting on March 31, 2015, Nancy Carlisle received the Colorado Chapter Champion Award. The award recognizes Nancy's demonstrated devotion to the principles of sustainable laboratories and related high-tech facilities from design to engineering to operation. Nancy is the Director of the Integrated Applications Center at NREL in Golden, Colorado. President Nick Caronna and the other newly elected Board of Directors of the I2SL North Carolina–Triangle Chapter welcomed prospective members to the inaugural meeting held May 5, 2015, in Raleigh, North Carolina. I2SL President Phil Wirdzek attended the event, joined by a large group of critical environment professionals representing a variety of laboratory safety, efficiency, and sustainability personnel. The meeting successfully created interest in joining the chapter and generated feedback and suggestions from prospective members regarding chapter plans and objectives. 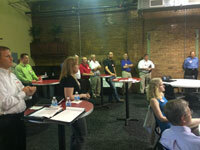 I2SL's North Carolina–Triangle Chapter gathers at its inaugural meeting. All current I2SL Members in the North Carolina region are encouraged to join this chapter to contribute to the health, safety, and economics of working in, maintaining, or managing laboratory and other critical environment facilities. If your organization is interested in being a chapter sponsor, contact the chapter to learn about sponsorship levels, costs, and benefits. Who says lab safety, efficiency, and sustainability can't be exciting? The North Carolina–Triangle's next meeting, tentatively scheduled for August, will be announced soon! Continuing the momentum of the Singapore Sustainable Laboratories Conference 2014, I2SL's Singapore Chapter will host Sustainable Laboratories Forum 2015 on September 3, 2015, at Marina Bay Sands hotel in Singapore to again bring together like-minded stakeholders to discuss and share knowledge on topics specific to safe and energy-efficient laboratories and high-tech facilities for the tropics. Co-located with the region's biggest green building event week and the International Green Building Conference, the forum will provide a bigger platform for collaboration and networking for participants. Following this event, representatives from the Singapore Chapter will travel to the United States for the 2015 I2SL Annual Conference! If you are interested in meeting the Singapore delegation to know more about the market opportunities for collaboration in the region and set up business-to-business meetings at the I2SL Annual conference, write the chapter. I2SL's Singapore Chapter, also known as the Singapore Sustainable Laboratories Group (S2Lab), formed in 2014 as I2SL's first international chapter. Stay tuned for more activities in Singapore. In November 2013, a Laboratory Fume Hood Summit was held at the University of California, Los Angeles (UCLA) to review and update consensus statements generated during a Fume Hood Workshop sponsored by Howard Hughes Medical Institute in 1998. The technology and standards for fume hoods and laboratory ventilation have changed significantly over the years, including increased focus on sustainability and energy conservation and advances in laboratory fume hood design, and many others. To learn more about the Laboratory Fume Hood Summit, read the full report. The UCLA Center for Laboratory Safety welcomes comments on the report in an effort to keep a dialogue going and share information. Thomas Smith of Exposure Control Technologies, Inc., and Louis DiBerardinis of Massachusetts Institute of Technology provided an overview of the UCLA fume hood summit and described some specific issues and consensus statements during the March 19 I2SL High-Tech Talks webinar. Face velocity alone is not a good predictor of containment. Air changes per hour (ACH) is not a health and safety design criteria. Ductless hoods must be used with care and their application must be carefully evaluated. Performance testing is important to do though only some standard tests exist. There was not consensus around how to employ demand control ventilation to minimize the overall air exchange rate in laboratories. The differing views are provided in the ventilation section of the report. View the webinar recording to learn about the webinar presenters' assessments of the consensus statements and non-consensus statements that came out of the UCLA summit. Thanks to all who participated in the Laboratory Benchmarking Working Group's Enhancing the Labs21 Benchmarking Tool survey! The survey received nearly 400 responses, which will help inform the working group's planned update to the Labs21 Benchmarking Tool. Survey results will be presented and reviewed at the 2015 I2SL Annual Conference, which will include a working group meeting to discuss next steps. Join the working group and participate in their meeting planned for September 23, immediately after the closing reception. Benchmarking is also making waves on Capitol Hill, with the Energy Efficiency Improvement Act of 2015 expected to be signed by the president. The bill aims to lower energy consumption in commercial and residential areas and has provisions that include promoting commercial building energy-use benchmarking and disclosure. Whether labs will be considered as applicable under this Act is not certain, but your survey responses will help the Benchmarking Working Group enhance the Labs21 Benchmarking Tool for easier use and value. In collaboration with Exposure Control Technologies, Inc. (ECT, Inc.), I2SL will soon offer a series of courses aimed at providing advanced technical curricula and training for high-performance building management and maintenance. Tentatively titled “Laboratory Ventilation Operation, Maintenance, and Management,” the initial series of classes will provide maintenance and management personnel with the knowledge and tools required to improve operations and maintenance of high-performance, critical-environment facilities. The goal is ultimately to provide a standardized I2SL certification program, available to organizations located across North America. An introductory course is slated to be available in summer 2015. I2SL recognized the Energy Innovation Laboratory (EIL) at the U.S. Department of Energy's Idaho National Laboratory (INL) with a Go Beyond Award at the 2014 I2SL Annual Conference, and the accolades did not end there. Idaho Senator Mike Crapo recently commended EIL for its selection as the 2014 Best Green Project in the Nation by Engineering News-Record. One of the few laboratories to achieve LEED Platinum certification, EIL features an energy-efficient design that uses nearly half the energy of conventionally designed laboratories. Senator Crapo acknowledged the collaborative work of the EIL project team, which included LEED coordinator and I2SL Founding Vice President Kath Williams. Read the full Congressional Record article for more information. 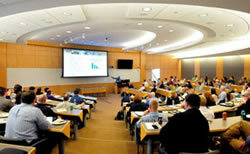 Attendees gather at Michigan State University's Secchia Center in Grand Rapids for a Green Labs Workshop. The West Michigan Sustainable Business Forum (WMSBF) last week hosted a Green Labs Workshop at Michigan State University's Secchia Center in Grand Rapids. WMSBF is a regional network of business, government, non-profits, and academia dedicated to promoting business practices that demonstrate environmental stewardship, economic vitality, and social responsibility. The Green Labs workshop featured I2SL Board Member Dan Doyle; I2SL Go Beyond Award winner and the University of Michigan Sustainable Labs Coordinator, Sudhakar Reddy; and Clinton Boyd, Green Chemistry and Sustainability Principal at Steelcase, Inc. The speakers presented on best practices in waste reduction, energy and water efficiency, green chemistry, and environmental safety efforts to make laboratory operations safer, more sustainable, and cost-efficient. The WMSBF also announced their Green Labs Certification program. The West Michigan Green Labs Pilot is a partnership of WMSBF and Michigan Department of Environmental Quality funded through the Community Pollution Prevention Program. The workshop was sponsored by Intertek. I2SL's Laboratory Benchmarking Working Group. With a background in astrophysics, I2SL's Laboratory Benchmarking Working Group Chair Alison Farmer shows that benchmarking isn't rocket science. Dedicated to energy efficiency, Alison brings to I2SL extensive experience as an energy efficiency consultant for lab facilities. I2SL caught up with Alison to discuss her role in the working group. How did you first get involved with I2SL and the Laboratory Benchmarking Working Group? I've been involved with I2SL ever since Phil Wirdzek volunteered me to be a jurist for the 2012 International Sustainable Laboratory Student Design Competition (thanks, Phil: it was a great experience)! In 2014, some colleagues and I had been talking regularly about lab benchmarking, so we attended the working group's kick-off meeting at the 2014 I2SL Annual Conference in Orlando, Florida. The group needed a leader, and I was ready to take it on. Describe your role in the Laboratory Benchmarking Working Group. I'm the group chair, which means I set the agenda for our conference calls, facilitate our discussions, and oversee tasks assigned to group members. I've also been issuing meeting minutes and organizing call-in details, but I think we're now ready to appoint a group secretary. Some readers might have noticed that I've also spent a lot of time promoting the 2015 benchmarking survey! What does volunteering with I2SL entail? There are lots of different ways to volunteer with I2SL, including serving on a local chapter board (the New England Chapter is particularly fun), reviewing conference abstracts, and joining a working group. Many tasks and topics are ready and waiting for some good leadership and hard work! What have you gained from your work with the Laboratory Benchmarking Working Group? I love to serve my clients, but the working group adds an opportunity to shape the bigger picture too, to help guide the development of our industry. The group has also allowed me to strengthen connections with talented professionals from across the country. I'd say choose something you'll be passionate about and make it yours. It's worth making time for a little pro bono work. Joining or leading a group is great for exposure and for making industry connections, and is an excellent way to make sure you're among the first to hear what's new. Talk to any I2SL volunteer or board member and we'll make sure you get involved in something rewarding. Learn more about I2SL's working groups, chapters, and annual conference on I2SL's website. I2SL's University Alliance Group, led by Kathryn Ramirez-Aguilar, will meet with federal agencies and universities to consider strategies for greening federal grants. Registration for the 2015 I2SL Annual Conference is now open. Stay ahead of the curve and save—register by July 24, 2015, to save nearly 10 percent off of the regular registration rate. Keep San Diego's waves and warm weather on your radar. Take advantage of the discounted block rate for conference attendees by booking your hotel room at the Hyatt Regency Mission Bay Spa and Marina by August 24, 2015. Get ready to have all the 2015 I2SL Annual Conference's offerings in the palm of your hand. The 2015 Onsite Mobile Application will be available this summer! I2SL's 2015 Go Beyond Awards are open for nominations! Nominate excellence in the sustainable laboratory and high-tech facility community through Tuesday, June 30, 2015. 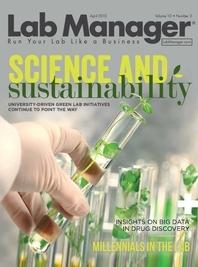 University Driven Green Lab Initiatives Continue to Point the Way, which features I2SL Members, Kathy Ramirez-Aguilar, Allen Doyle, and Amorette Getty.